When it comes to keyboards, there’s plenty to choose from if you want to connect one to an iPad or an iPhone. In fact, there doesn’t seem to be a week go by where our inbox isn’t host to at least one email extolling the virtues of yet another Bluetooth keyboard that’s been designed for use with the iPad. Logitech is one of the largest accessory manufacturers on the planet, and it too has its fair share of Bluetooth iPad keyboards on the market which is why we found ourselves underwhelmed at the thought of it announcing another. Turns out though that the keyboard isn’t quite as it seems. For starters, it’s not Bluetooth enabled at all. Set to cost $60, Logitech’s new iPad keyboard is actually of the tethered variety, which is something we don’t see every day. Aimed at classroom use, each keyboard is spill resistant, has a three-year warranty and is apparently good for over five million keystrokes. That’s a lot of words indeed. 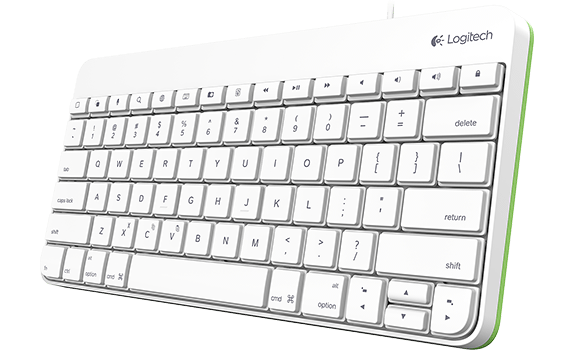 If you’re happy to go the tethered route, then Logitech’s new keyboard is going to be available in two versions; one will be designed for tablets sporting Apple’s new Lightning connector, whilst the other will feature the traditional 30-pin connector. Both will cost $60, with the Lightning version shipping in August. If you need the 30-pin version though, you’ll need to wait until November. Both can be pre-ordered from Logitech right now though. Super fast plug and play wired connection. Simply plug the keyboard connector cable into iPad® and off you type. Available in two versions with either 30-pin Connector or Lightning Connectors. Whilst Bluetooth keyboards are all the rage, the question has to be asked: just how far away from your iPad are you ever going to be? With that in mind, why not save some cash and have a little white cable instead? 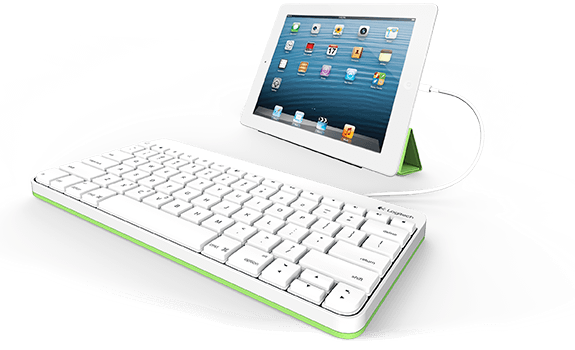 The keyboard itself is a nice looking piece of kit, mainly white with green accents. The main thing is it looks durable, which if it’s going to live life as a classroom keyboard, it will need to be!